Rimrose Carpets are a local family run business based in Liverpool with three generations trading for over 50 years. We source unique one off designs along with traditional, modern and bespoke carpets to give you the widest selection possible. We buy direct from manufacturers so we can always offer the best deals around. Along with the biggest names in the carpet world, we offer expert fitting service with time served tradesmen ready to install your new carpets, vinyls and artificial grass. 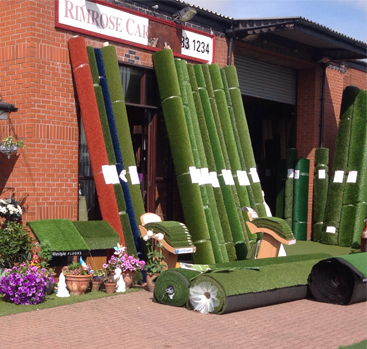 Come and visit us at our warehouse on Rimrose Road Bootle to see our extensive range of carpets, vinyls rugs and the largest selection of artificial grass in the north west! We are the North West’s largest stockist of Artificial Grass with over 100 rolls in stock ready to go. Our team of experts can assist you on finding the right product. The best value and quality carpet fitter and supplier in Liverpool. Fantastic Company - Dave and his team are very helpful, and bend over backwards to suit your needs. I would highly recommend them. Furthermore, I received 3 quotes and Rimrose were by far the cheapest. Great service and great value for money!! A pleasure to deal with David and his team. They were very helpful and knowledgeable. Highly recommend them. We have a massive range of Carpets, Artificial Grass, Vinyl, Rugs and Laminates on display in our purpose built showroom. We are conveniently located and have ample free parking. Call in and see us to discuss your requirements.